Take everything you need for your trips with the trendy and cool voyager tote. Screen print your business logo and tag line on the tote, to gain widespread visibility for your brand. Take everything you need for your trips with the trendy and cool voyager tote. 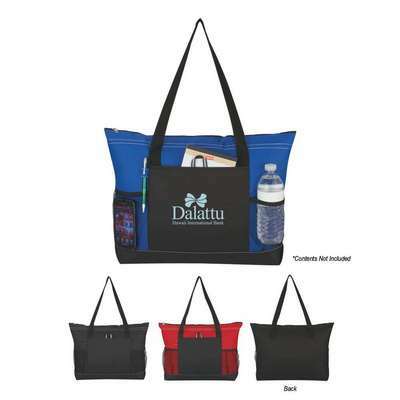 Screen print your business logo and tag line on the tote, to gain widespread visibility for your brand. The tote is made of 600D polyester material and has a top zippered closure for optimum security. Its large front pocket, 2 mesh side pockets, and a pen loop provide sufficient storage space. The 22” web handles make it easy to carry the tote. Spot clean/air dry to prolong the tote’s lifespan. Get a cost effective, high exposure solution for your promotional needs by giving away the tote at trade fairs and expos.